Enjoy the amazing voices of Four Corners Jazz, as these incredibly talented WMU students sing your favorite labor and protest songs at the Fall BBQ on Tuesday, September 3, 5-7 p.m., at Montague House. That’s right: The BBQ will feature performances by Four Corners Jazz as well as WMU’s own Allison Downey & John Austin. There will also be face painting and balloon animals for the kiddos, plus great food catered by Big Moe’s and the long-awaited return of adult beverages. With a line-up like that, plus the great company of many friends and colleagues, we’ve got the ingredients for an awesome party and for the kick-off of our 2013-14 contract campaign. The weather forecast for Tuesday is looking good, too. It’s not too late to RSVP. 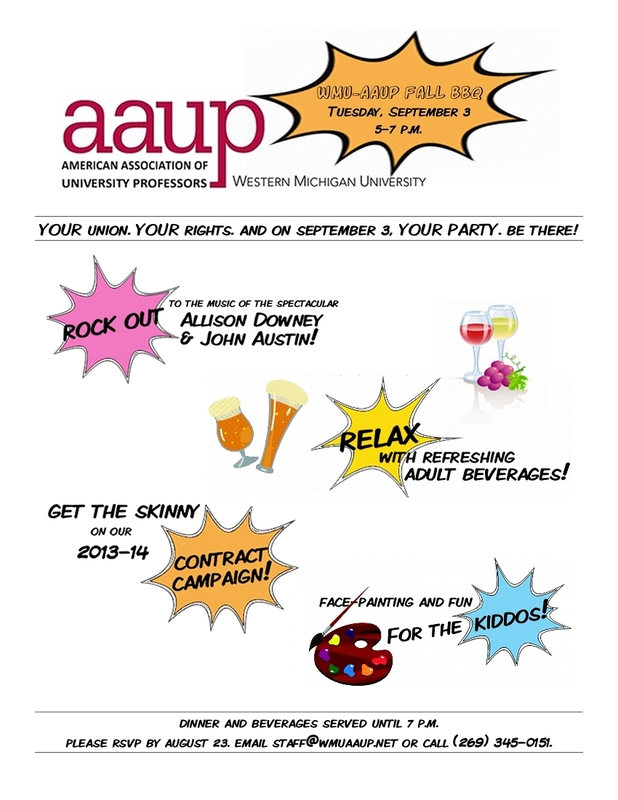 Call (269) 345-0151 or email staff@wmuaaup.net. This entry was posted in Campus Events, News and Updates by lcm. Bookmark the permalink.